Coating cereal products adds variety, interest and value to breakfast products. The addition of syrups, frostings, glazings and coatings needs to be accurate and consistent to maintain top product quality. 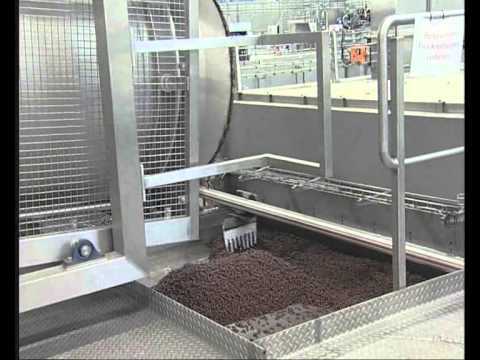 An easily expandable, specialised and fully automated syrup and coatings cooking, mixing and coating system increases quality and consistency whilst reducing costs. The Baker Perkins range of syrup preparation and coating systems offer highly consistent and accurate coating solutions for a range of cereal-based product. Options available are extensive, from glazed and glossy coatings through to frostings and chocolate coatings. To address the need for healthier products, all coatings can be made as sugar-free alternatives. accurately maintained. Fine control of final solids ensures that the coatings adhere evenly, are not sticky and provide the required appearance and texture every time. Baker Perkins coating systems use double coating drum systems. This means one drum can always be operational whilst the other is being cleaned. This reduces your line downtime to an absolute minimum. All components are designed specifically for the required coating task, but are completely modular. This allows for simple and cost-effective expansion. Systems are available from batch dissolvers to continuous, skid-mounted systems. This flexible set-up means each system can be specified to meet individual product requirements. Range of coating options available, including sugar-free. Low solid, high solid and syrups.